Bestop TrekStep Side Bed Steps 02-18 Dodge Ram Drivers Side Bestop TrekStep Drivers Side Bed Step 02-18 Dodge Ram, Bestop TrekStep Bed Step 02-18 Dodge Ram, Bestop Bed Step 02-18 Dodge Ram, TrekStep Side Bed Step 02-18 Dodge Ram, Bestop 75307-15 Truck Bed Step, [Bestop 75407-15 Truck Bed Step] - $219.95 : 3rd Strike Performance, Your Source for Late Model MOPAR Performance Parts and Accessories! 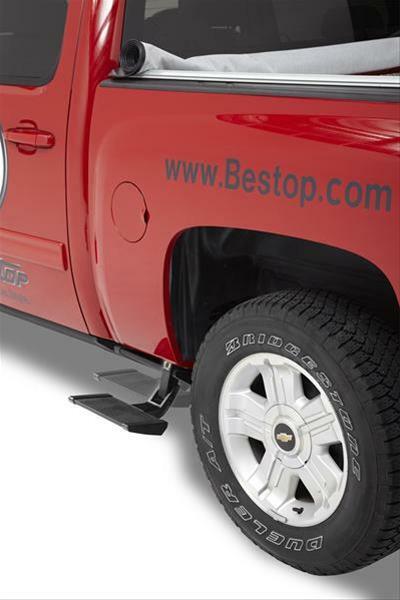 Bestop TrekSteps allow you easy access to your pickup bed, even with the tailgate down. These Bestop TrekSteps are spring-loaded steps that allow for easy deployment and retraction with the push of your foot. Made of high-strength, die-cast aluminum alloy with a heavy-duty thermoplastic step plate for sure footing, these TrekSteps store conveniently under the rear bumper or side of the pickup bed. Notes: Will Not Fit Dually Models! Provides 6.00 to 8.00 in. of downward extension depending on application. Has a 300 lb. capacity.